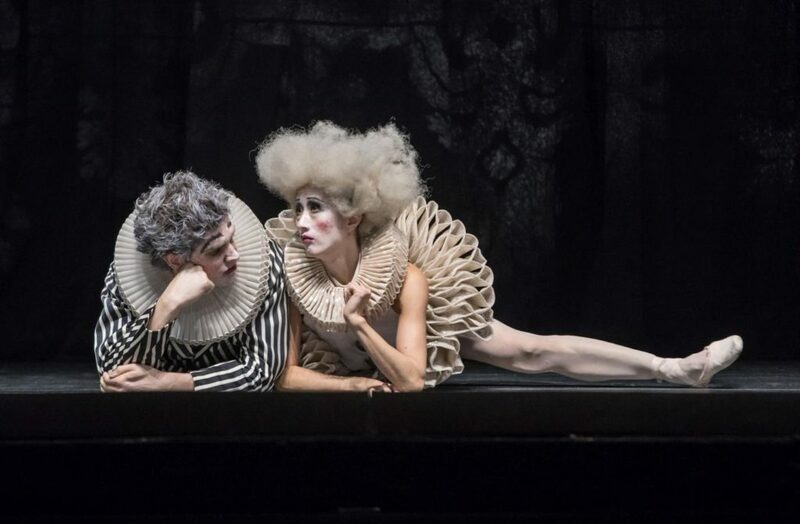 This season the Opera House Zurich launched a new website, new large black and white portraits of dancers of the company decorate the opera’s corridors and side rooms and it also has a new “Nutcracker”. 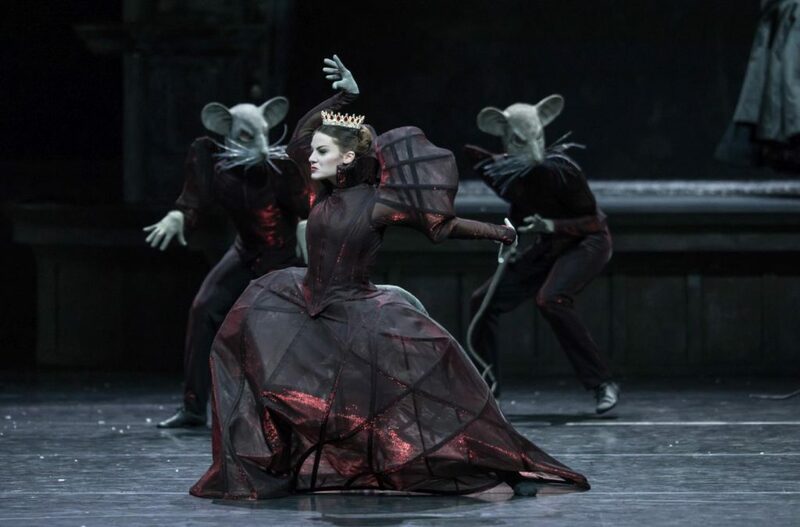 More precisely, its “Nutcracker and Mouse King”, as choreographer and artistic director Christian Spuck based the story on E.T.A. Hoffmann’s original fairy tale of the same title rather than on the sweetened and simplified adaption of Hoffmann’s text Alexandre Dumas père wrote in 1844. The latter served as a libretto for Marius Petipa and Lev Ivanov’s famous ballet to music by Tchaikovsky. 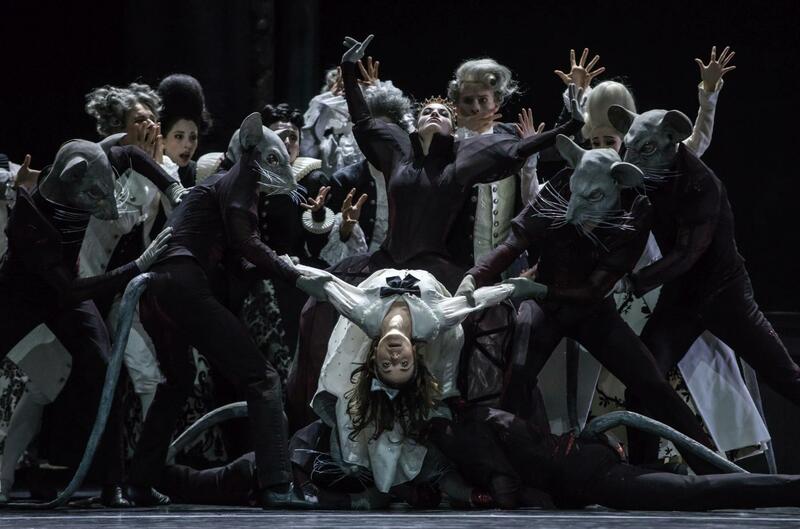 Having already created ballets on “The Sandman” and “Mademoiselle de Scuderi”, “Nutcracker and Mouse King” is Spuck’s third ballet on a text by E.T.A. Hoffmann. Spuck undertook some basic changes. He kept Tchaikovsky’s music, but rearranged and rededicated the musical numbers. 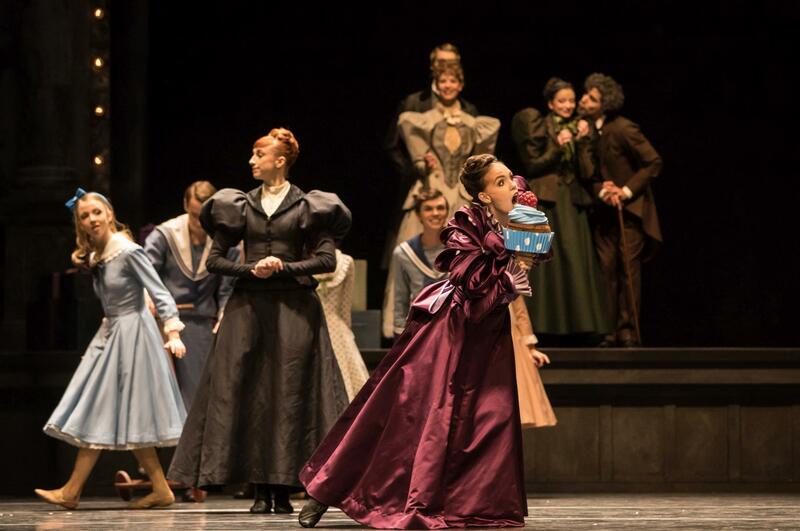 Most of the familiar second act divertissements were dropped except for the Waltz of the Flowers and a solo of the Sugar Plum Fairy, but she dances to the music originally destined for the Arabian Dance. Tchaikovsky’s music was given a colorful rendition by the Philharmonic Orchestra Zurich under the baton of Paul Connelly. A few chords were played on the accordion by Ina Callejas. 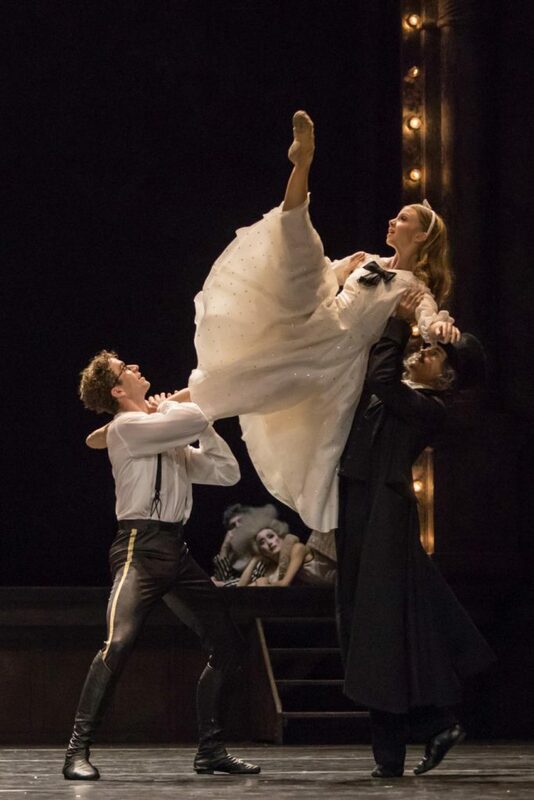 The new libretto, assembled by Claus Spahn, didn’t begin with the Christmas Eve at the home of the Stahlbaum family, but had Drosselmeier (Dominik Slavkovský) tell his two godchildren – Marie and Fritz Stahlbaum (Michelle Willems and Daniel Mulligan) – the fairy tale of the Princess Pirlipat (Giulia Tonelli) with the help of a puppet theater coming alive. Pirlipat’s story is double-barreled. Her father, the King (Gustavo Chalub), bayoneted a mouse. Spuck omitted the motive for this murder – it has to do with bacon and royal sausage making – but the mousetrap depicted on the cover of the program book hints at the background. 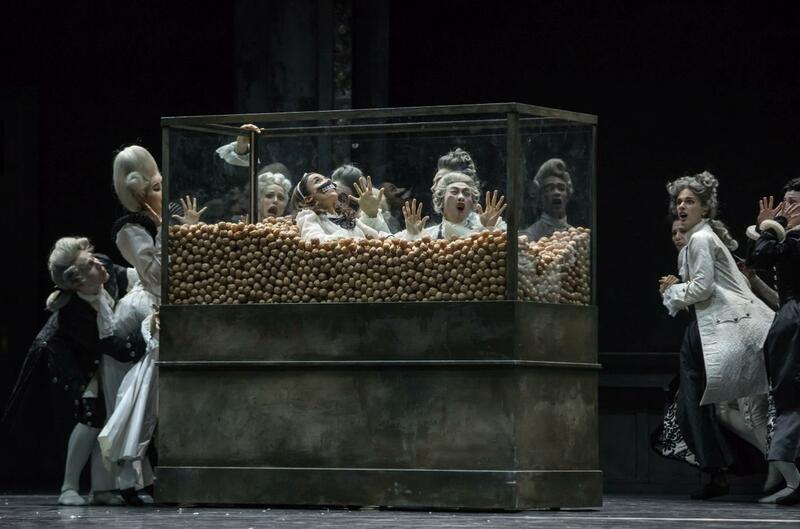 The Mouse Queen Mrs. Mauserinks (Mélissa Ligurgo) takes revenge by turning Pirlipat into a nut-eating monster. (At this point Tonelli, wearing a mouth-mask with huge teeth, sat inside a terrarium filled with walnuts which she eagerly cracked.) Only by eating a certain nut would Pirlipat be rescued. Naturally, this nut is provided by a Prince (William Moore) and, even more naturally, he is the only one able to crack it. The Mouse Queen, furious about Pirlipat’s salvation, attacks the Prince, and gets squelched by him. While dying she takes revenge by turning him into a wooden nutcracker. In Hoffmann’s book, Drosselmeier tells Pirlipat’s story on three consecutive evenings. 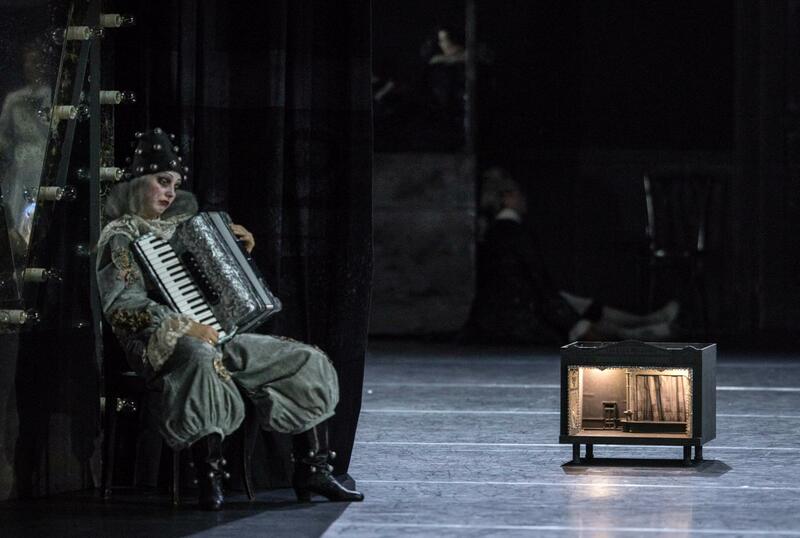 The ballet keeps this segmentation by switching to and from Drosselmeier’s puppet theater to the Stahlbaums’ real life – their Christmas preparations and the quarrels between Marie and Fritz. The Nutcracker’s re-transformation into the Prince largely follows Petipa and Ivanov’s version. 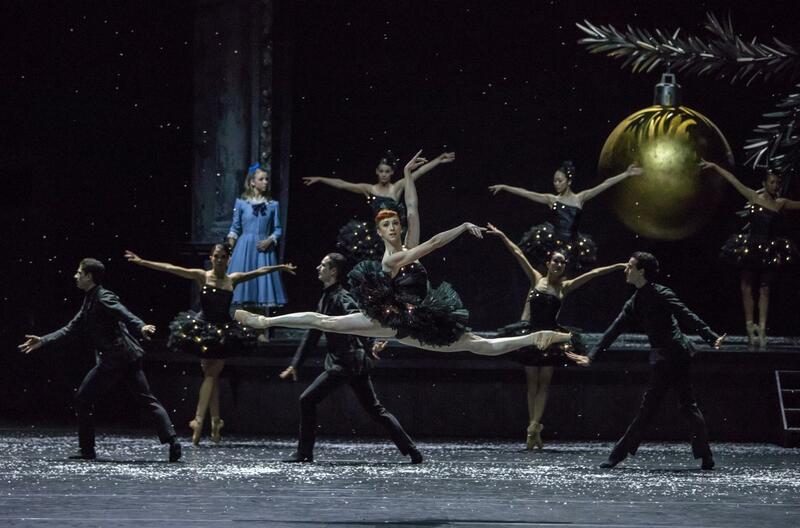 It sets off with the well-known Waltz of the Snowflakes at the end of Act I, except that Zurich’s snow-flakes wear black tutus decorated with small lights rather than white ones. Then Fritz’s tin soldiers come alive and fight against the mice, the Nutcracker-Prince kills the Mouse King (Cohen Aitchison-Dugas) and although the Prince disappears off the face of the earth afterwards, Marie promptly finds another object of love in Drosselmeier’s nephew (also William Moore), who looks stunningly like the Prince. The plot is complicated, but Spuck worsened matters by adding yet another level to the storyline: three clowns (Yen Han, Matthew Knight and – playing the accordion – Ina Callejas), presumably belonging to Drosselmeier’s puppet theater, who framed, observed, and interfered with the goings-on. Even before the curtain went up they frolicked around on the front stage. In total Spuck invented four levels – the clowns (1), the Stahlbaums’ family life (2), Pirlipat’s story told by Drosselmeier’s puppet theater (3), and Marie’s dream of her trip to the land of sweets (4) – that mingle in one room, which is a mix between a living room and an old theater with an extra stage in the rear. I wonder whether the children in the audience – and there were quite a few – understood the intricate story. Set designer Rufus Didwiszus framed the arch of the forestage with a band of lights that added a touch of a revue to the performance. The stage of the puppet theater had a band of light too. Actually, it’s the magnified version of a small toy model of a puppet theater that was carried around a few times. Usually, the differences in size between the toys and the human beings are visualized by the Christmas tree that grows and grows the moment the story enters the realm of the toys. Didwiszus designed an oversize Christmas ball hanging on a fir branch instead, that appeared as backdrop of the puppet theater. The similarly huge pendulum that suddenly swung across the entire breadth of the front stage when the clock stroke midnight came as a surprise effect. Israeli Buki Shiff was in charge of the costumes. 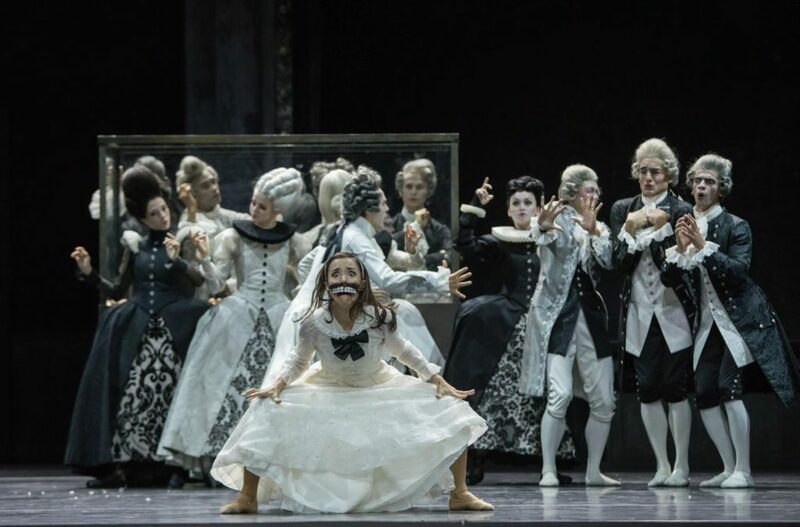 Drosselmeier’s puppets were clad in Baroque style in black and white colors, had enormous and partly quirky wigs, white made-up faces and red cheeks. They moved jerkily like dolls, often froze in awkward poses and, when bunched together, alternately raised or crouched down. Their slightly bent knees and shoulders made them look a bit silly. On a few occasions the puppet court danced group routines. Witnessing the Prince’s transformation, they gaped their mouths and mimed astonishment in slow motion. A low drum roll sounded, but the scene was too long to be exciting. The Stahlbaums depicted a conservative and well-off family in the second half of the 19th century. The women paraded silk dresses with vast puffy sleeves, and the men wore tailcoats. 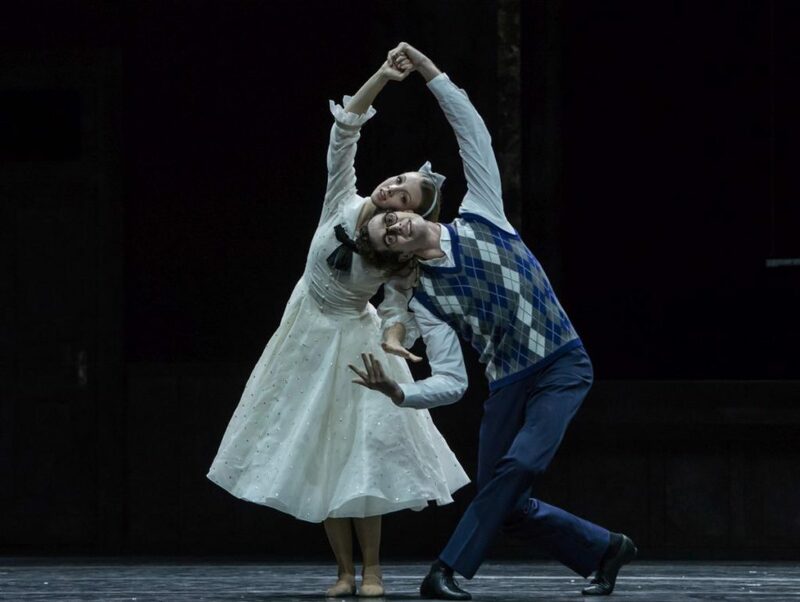 The most heartwarming pas de deux was danced by the sprightly grandfather (Filipe Portugal) and his charming spouse (Galina Mihaylova), who jauntily swirled around despite lower back pain. Marie wore a light blue dress, had a ribbon in her hair and behaved similar to how she looked – childish. She pouted, gathered the hem of her skirt and gamboled around, stepped vigorously out with flexed feet, screamed shrilly and much too often bumped down on her bottom out of sheer amazement at the puppet play. 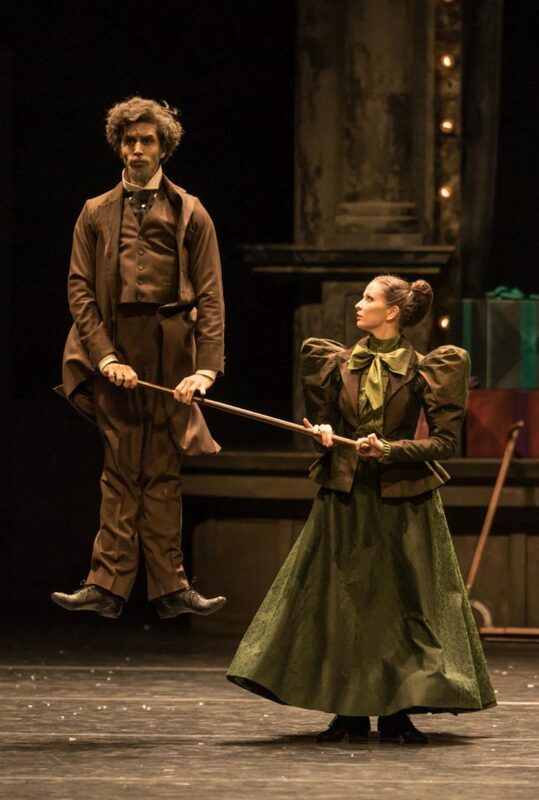 Sweeping turns and lifts characterized her budding romance with the Nutcracker / Prince / Nephew of Drosselmeier, but still she seemed a pubescent teenager, not a young woman seriously in love. Princess Pirlipat, Marie’s alter ego in the fairytale realm, had a similar movement vocabulary but was more headstrong and energetic. Later, after Marie had switched her blue dress with a white one, both she and Pirlipat looked very much alike. William Moore had three different roles, and in all he was bespectacled and the girls fell for him. Coming by in horseman dress with a skateboard under his arm (alas – no horse! ), he released Pirlipat from being a monster stuffing itself with nuts. As the Nutcracker he at least had a posh uniform even though his range of movement was limited. But as Drosselmeier’s nephew, wearing a checkered sleeveless pullover over a white shirt, his shoulders sagging and looking slightly absent from behind his glasses, he reminded one of an office assistant slow on the uptake. Why Marie had a crush on him can only be explained by dream-induced delusion. Slavkovský’s Drosselmeier was a figure of the late 19th century, whose role didn’t develop beyond playing sinisterly with his fingers and rubbing his hands. He made his coat flap, puffed clouds of smoke and darted piercing glances. His relationship to Marie had the unpleasant overtone of an old man overly interested in a girl. As Fritz, Mulligan was trapped in a light blue sailor suit in a silly, one-dimensional role restricted to being unruly, restive and dashing around on his roller. The fights between the tin soldiers and the red-black mice lacked interaction and were lame mock, but the mice themselves, with their crawling, scuttling, and dramatic dying, were convincing. Less so was the Flower Waltz in the land of sweets, which had little sign of the buoyancy or bliss unique to waltzes, but was an unremarkable group dance with a solo for Anna Khamzina and Alexander Jones. The costumes for the cavaliers were insofar remarkable as the men looked thoroughly ridiculous. They wore full beards made of flowers next to pants and suspenders in gaudy colors, that matched the flower-tutus of their ballerinas. As the Sugar Plum Fairy, Viktorina Kapitonova sported a bright pink tutu decorated with cup-cakes. Her main concern in her solo was whether to nosh on the cakes or to keep others from doing so. With the Snow Queen and the leading ballerina of the Flower Waltz, she doubled as Marie’s and Fritz’s aunts. I was very glad to see Elena Vostrotina dance the Snow Queen. She left Semperoper Ballet Dresden in May 2016 and, after some guest appearances, finally found a new home in Zurich. A tall ballerina, Vostrotina is able to amalgamate strength and softness. 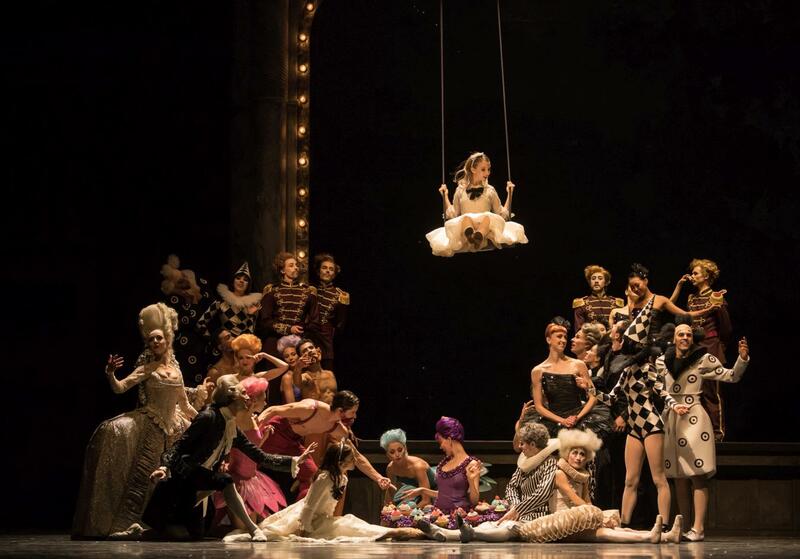 The Zurich Opera’s stage seemed almost too small for her generous jumps. 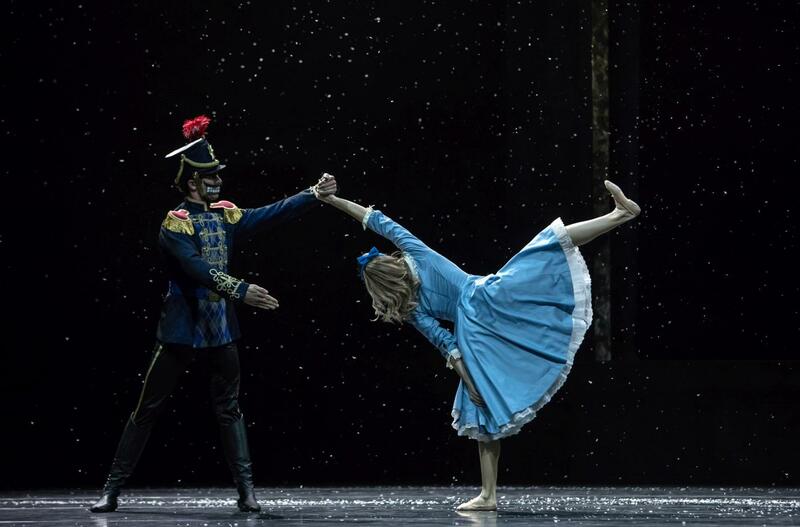 “Nutcracker and Mouse King” offered limited pleasure for two reasons. First, Spuck re-used existing choreography instead of serving something original. 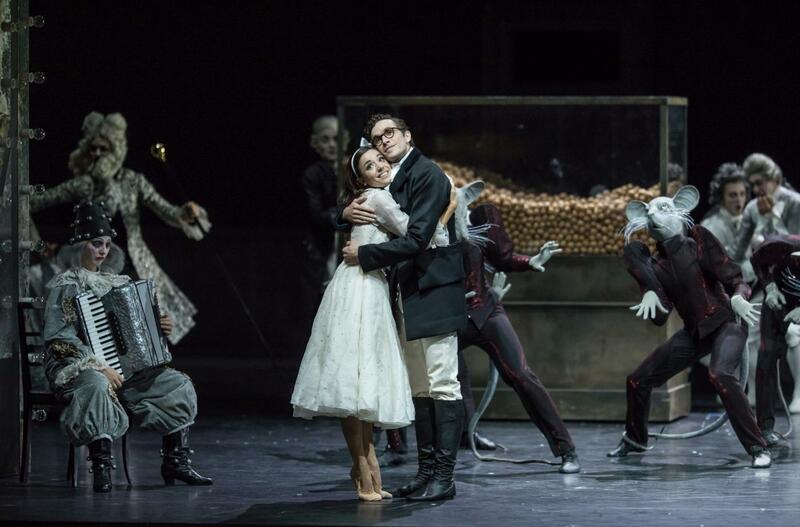 Vast parts of the group dances and the pas de deux were strongly reminiscent of his former pieces, mainly of “Leonce & Lena”. Some scenes, such as the two clowns lying on their stomachs, resting their heads on their hands, seemed one-to-one copies. I wonder whether Spuck intended for the recognition factor or supposed his audience wouldn’t notice the replicate. The idea of a theater within the theater isn’t new either. 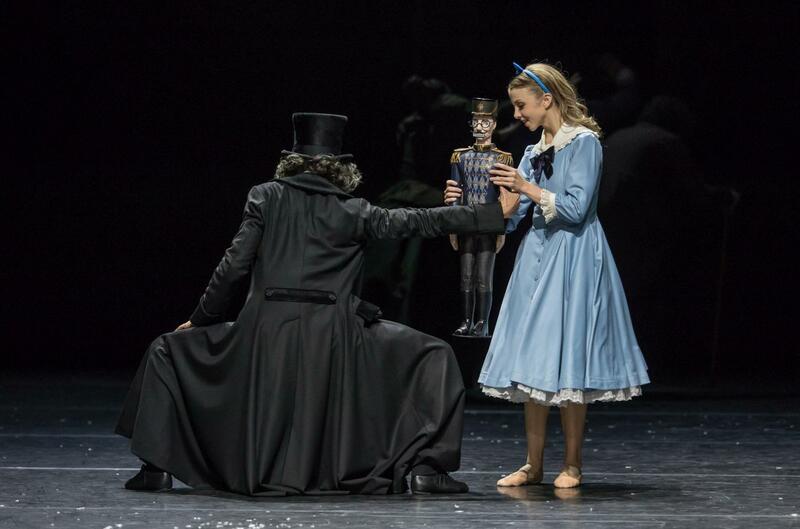 Spuck himself used it in his opera “Orphée et Euridice”, and John Neumeier included a puppet theater as well as a second stage onstage in his “Nutcracker” in 1974. 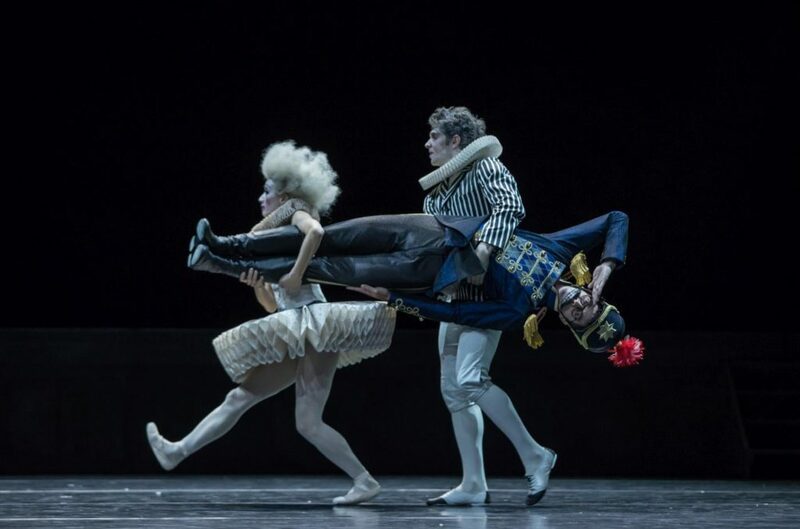 Other ideas borrowed from colleagues were the little toy mice that scurried across the stage (Marco Goecke used a toy rat in his “Deer Vision” for Ballet Zurich in 2014) and a tap dance solo for the male clown – a quite unashamed (and unsuccessful) rip-off of Christopher Wheeldon’s Mad Hatter from “Alice in Wonderland”. The ballet’s second weak point was its labored fooling about. Spuck strained for effects but lacked the instinct to make them work. His “Nutcracker” ended in party mood with silver balloons showering down. Maybe that’s not everyone’s vision of the Nutcracker story.